Data from MoGene was received today on two DVDs and one HDD. Data is two runs of two libraries, due to MoGene concerns that the data of the first run looked bad (too few reads). They performed a second run at no charge and provided us with that data as well. This entry was posted in Miscellaneous and tagged 454 sequencing, gonad, liver, ovary, Pacific herring on 19 November, 2009 by kubu4. This entry was posted in Miscellaneous, Samples Submitted and tagged 454 sequencing, gonad, liver, mRNA, ovary, Pacific herring, SR01, SR02 on 27 October, 2009 by kubu4. 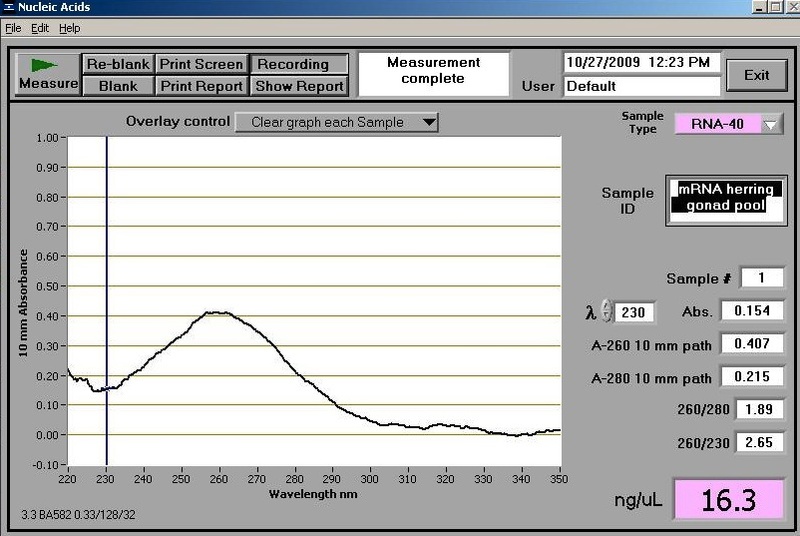 This entry was posted in Miscellaneous and tagged EtOH precipitation, gonad, Micro PolyA Purist, mRNA, mRNA enrichment, NanoDrop1000, ovary, Pacific herring, RNA quantification on 27 October, 2009 by kubu4. A subset (3 samples from each group) of samples were pooled (see spreadsheet, green-highlighted samples), each providing ~7.5ug of RNA, yielding 112.17uL. 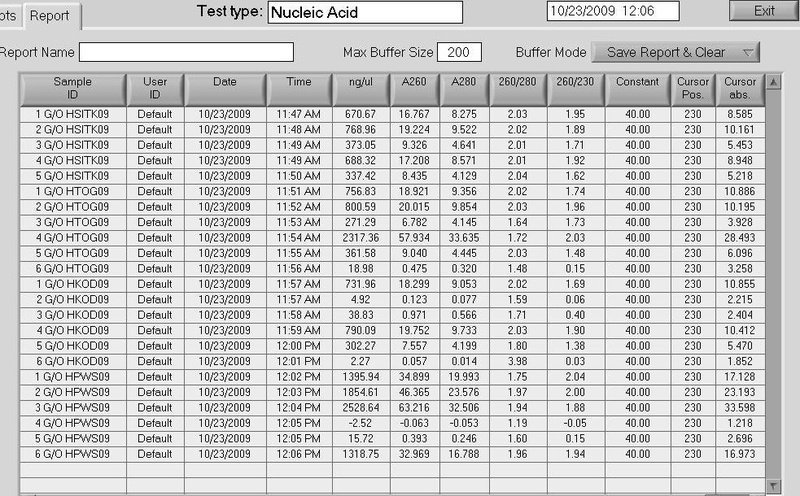 0.1 vols of 3M NaOAC, pH = 5.2 were added to the tube (11.22uL). 2 vols of EtOH (246.8uL) was added to the tube. Tube was vortexed to mix and incubated @ -20C O/N. This entry was posted in Miscellaneous and tagged EtOH precipitation, gonad, ovary, Pacific herring, RNA on 26 October, 2009 by kubu4. RNA was isolated according to protocol. Pellets were resuspended in 50uL of 0.1%DEPC-H2O, heated @ 55C for 5 mins, spec’d and stored @ -80C in the “Herring RNA Box #1″. Most of the samples look good, however there are a number of samples that are downright bad. Either no RNA or very low concentrations with poor 260/280, 260/230 ratios. This entry was posted in Miscellaneous and tagged gonad, NanoDrop1000, ovary, Pacific herring, RNA isolation, RNA quantification, TriReagent on 23 October, 2009 by kubu4. From the Seeb Lab. Homogenized entire gonad/ovary samples in 5mL of TriReagent with the sonicator. In essence, based on the manufacturer’s recommendation, this means the ratio of tissue:TriReagent was ~2x. Transferred 0.5mL of homogenized gonad/ovary sample to 1.5mL snap cap tubes and added an additional 0.5mL of TriReagent, to adjust the ratio of tissue:TriReagent to ~1x. Samples were then stored @ -80C. These will be further processed tomorrow. This entry was posted in Miscellaneous and tagged gonad, ovary, Pacific herring, RNA, RNA isolation, TriReagent on 22 October, 2009 by kubu4.